Standard - €6.99 Only 9 left! If you're a fan of the wonderous world of theater then you've probably heard about the many different types of stock characters. One stock character that we are a big fan of is the mischievous romantic hero known as a Harlequin! They were known for secretly undermining their masters in pursuit of their own romantic endeavors as well as adding a bit of pizzazz to their performances with cartwheels and other somersaults. Sounds like a pretty fun role right? Well, try taking this character off of the stage and bringing it into the homes of your friends and family this year for Halloween! You can spend all night running around as a comedic acrobat and bring joy to many people's faces! All you'll need is a traditional Harlequin mask and hat, then from there just make sure you are covered in a checkered pattern from head to toe! 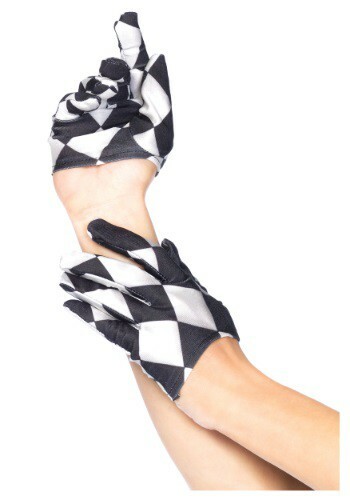 Start with this Harlequin Mini Cropped Gloves and you'll be well on your way. Just make sure you practice your somersaults so you can really bring this classic character to life!